London Stadium, also known as London Olympic Stadium, got built to serve as the centerpiece stadium for the 2012 London Summer Olympics, during which it hosted the athletics events and opening and closing ceremonies. Little attention had been paid to the legacy of the stadium following the games, however, and it soon turned out that a football club moving in would be the only financially viable long-term solution despite the stadium being ill-designed for football purposes, which would require a significant redevelopment. 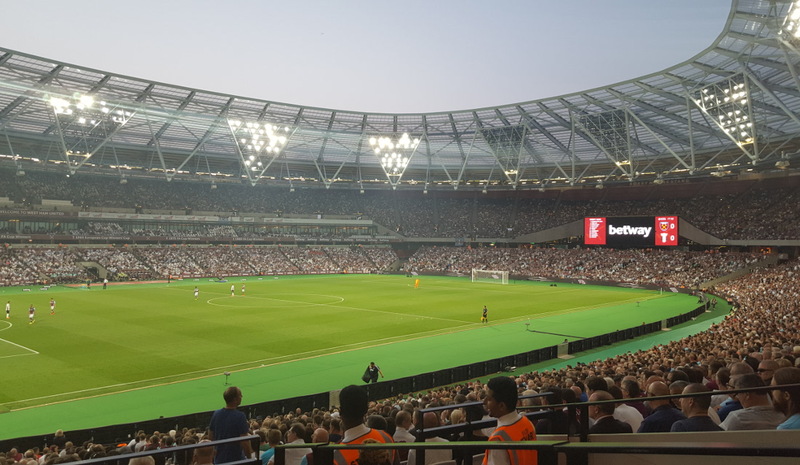 In 2013, following a lengthy and contentious bidding process including Tottenham Hotspur and Leyton Orient, West Ham got awarded a 99-year lease to the stadium. The stadium would subsequently get redeveloped to suit it for both football and athletics, including the reconstruction of the bottom tier into retractable stands and the construction of a new roof. The redevelopment works started in 2013 and by the end of summer 2015 the stadium was ready to host its first sporting events in the form of the Rugby World Cup. 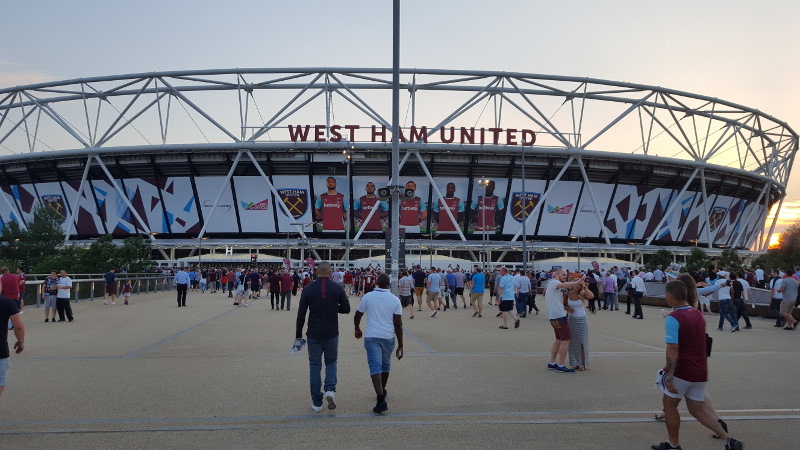 West Ham moved into the stadium in the summer of 2016, leaving their previous home Boleyn Ground. Their first match at the stadium was a Europa League fixture versus Domzale (3-0). 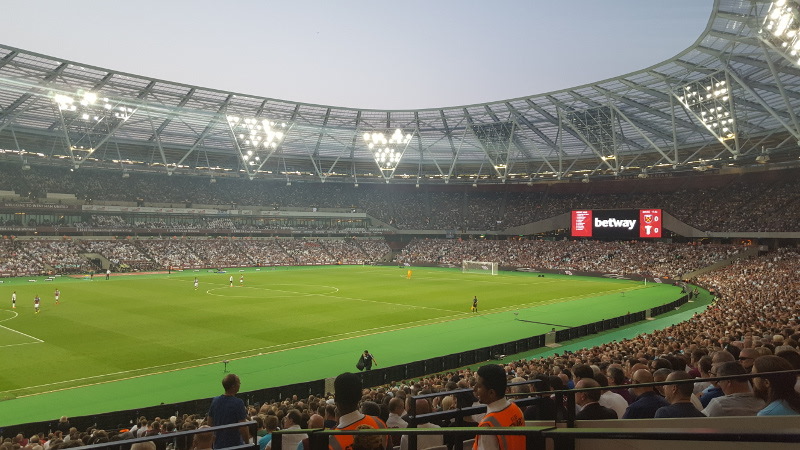 While attendances have surged and West Ham sold out their season ticket allocation in their first year at London Stadium, problems have also arisen in the form of poor sightlines, inadequate stewarding, and crowd trouble. 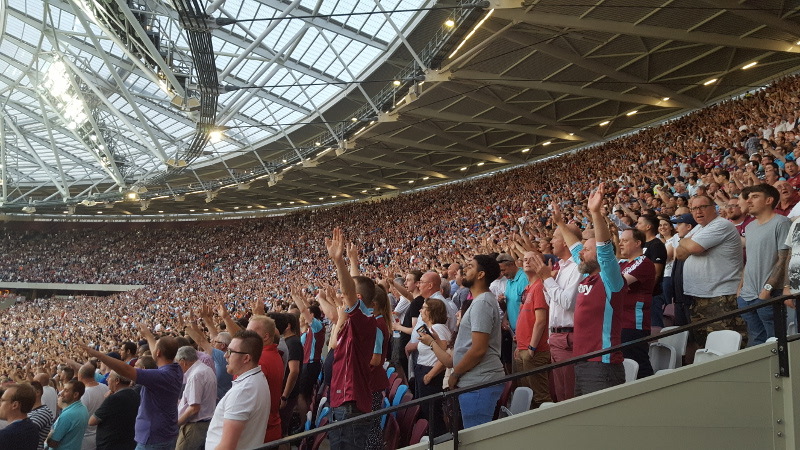 Right now West Ham is leaving 3,000 seats unsold, capping capacity at 57,000. London Stadium is located on the Queen Elizabeth Olympic Park in the Stratford area in the east of London, about 3.5 miles away from the City. Stratford has excellent transport connections with the rest of London, and can be reached by various underground and overground rail lines. From central London, the stadium can be reached by tube with either the red Central Line (e.g. Oxford Street and St Paul’s), or the silver Jubilee Line (e.g. London’s South Bank and Westminster). Get off at stop Stratford, from where it’s a 10-minute walk to the stadium. From most central London destinations it takes 10 to 15 minutes to reach Stratford by tube. From certain North London destinations (e.g. Islington or Camden) it may be quicker to catch the overground to Stratford, which is the last station on the line. From a number of local East London destinations and London City Airport, the DLR light rail can be used to get to the stadium. There are no parking facilities near the stadium so arriving by car is not encouraged. 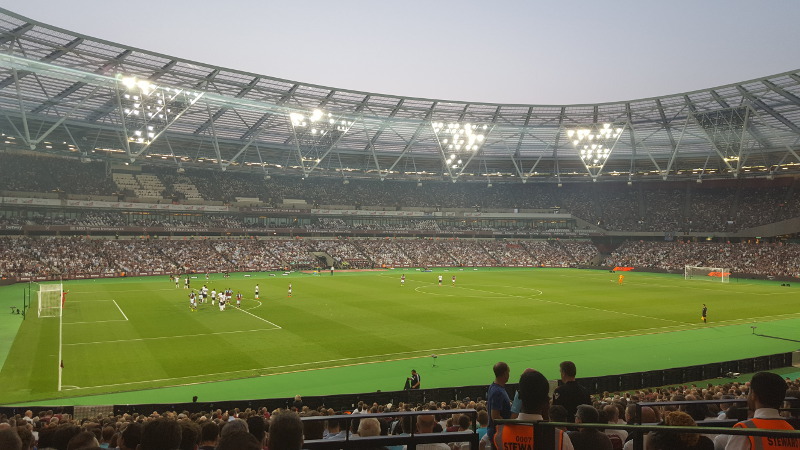 London Stadium is situated on Queen Elizabeth Olympic Park in London’s Stratford area, which has seen a wave of regeneration since the opening of the stadium in 2012. The centerpiece of the new Stratford is Westfield Shopping mall, which boasts a large number of restaurants and some pubs for local eating and drinking. The rest of Stratford is less attractive though and there is little reason to venture out, though Queen Elizabeth Olympic Park is great on a summer’s day. There is a good amount of hotels near the Olympic Park, and finding a hotel here is often more affordable than in central London and a great base to explore the rest of London. There are a Holiday Inn, Premier Inn, and somewhat more luxurious Staybridge Suites right at Westfield mall that all get good reviews. A slightly more affordable Ibis a few steps further away is an alternative. Click here for an overview of hotels near London Olympic Stadium. West Ham tickets can be bought online, or by phone+44 (0) 333 030 1966. 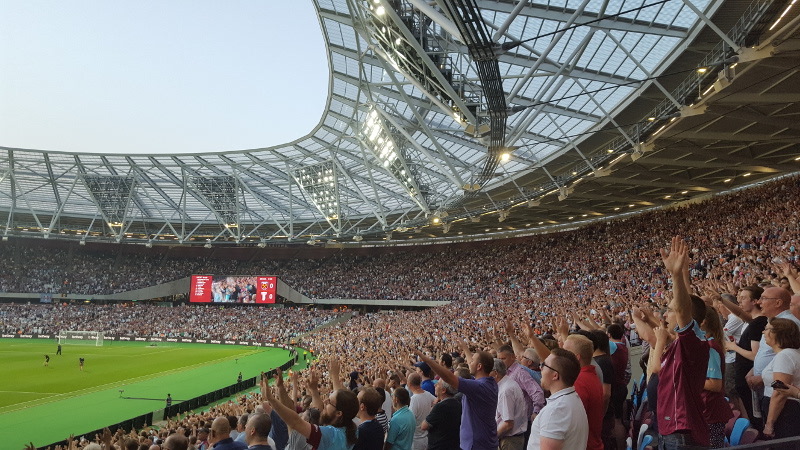 Following their move to the London Stadium, West Ham’s attendances surged and they sold out their first few games, though interest has dropped a little subsequently and tickets for most fixtures save the top teams and local derbies will now be available on general sale. That said, the stadium still regularly sells out so it is recommended to buy well in advance. West Ham’s ticket exchange where season ticket holders list their tickets can be an alternative if the match is sold out. Ticket prices depend on the opponent. Ticket for category C games, the cheapest range in price from £25.00 to £40.00, those for category B games from £30.00 to £60.00, and those for the most expensive category A games from £50.00 to £80.00. Email ticketoffice@westhamunited.co.uk or call+44 (0) 333 030 1966 for more information. 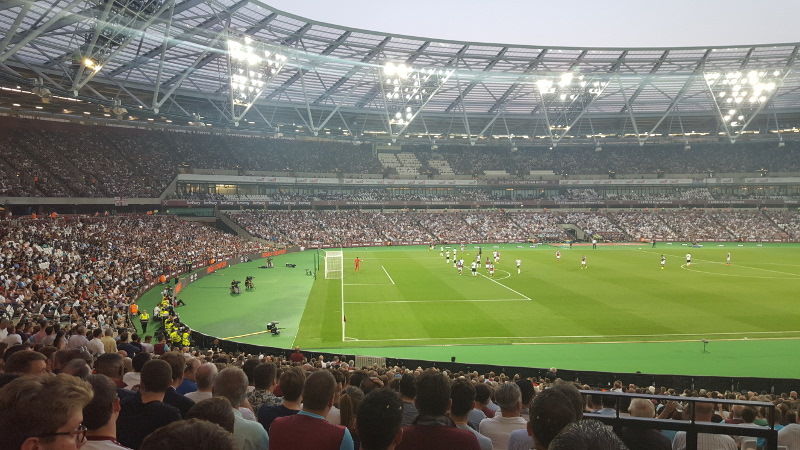 London Stadium offers self-guided multimedia stadium tours, which, among others, include the players’ tunnel, dugouts, changing rooms, and stands. The stadium opens for tours seven days a week, Monday to Friday & Sundays from 10:00 am to 4:45 pm (last entry at 3:30 pm) and on Saturdays from 9:30 am to 5:45 pm (last entry 4:45 pm). From October to Match last entry and exit times are 30 minutes earlier. The stadium does not open on event days and reduced opening times may apply on other days so make sure to check the London Stadium official website for latest schedules. The tour costs £17.00, bookings can be made online. Whufc.com – Official website of West Ham United FC. 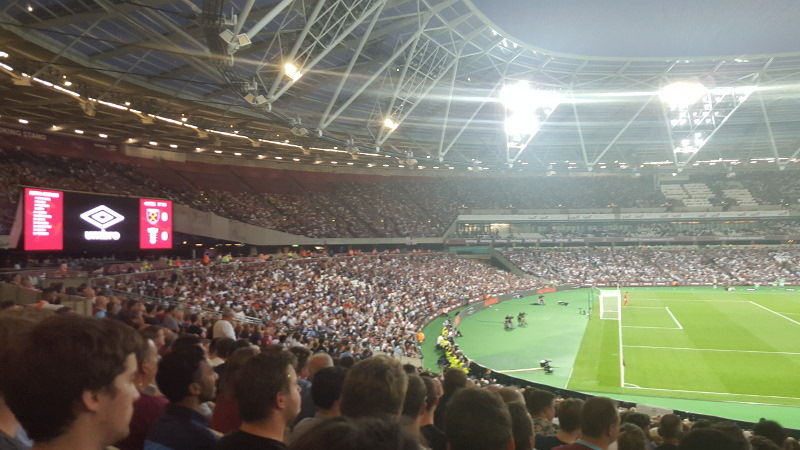 I went there to watch West Ham against Juventus. It is very easy to get to the stadium, but walk from the metro station seems to take ages. Stadium itself is very modern and nice. Most people would probably prefer the old ground which was more intimidating for the visiting teams and home fans created great atmosphere inside. It is a great piece of architecture, but not to everybody’s taste.